Nibiru’s a planet. 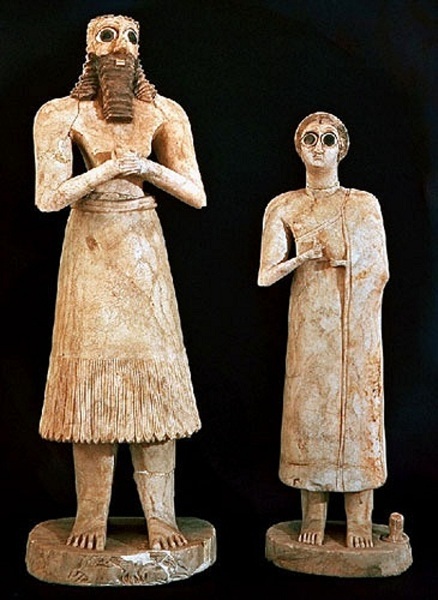 It’s the home of tall white mostly Homo sapien geneticists who came to Earth 450,000 years ago, adapted their genome to create us to mine gold for them and told us to call them the Anunnaki, or the Lords (“el”). 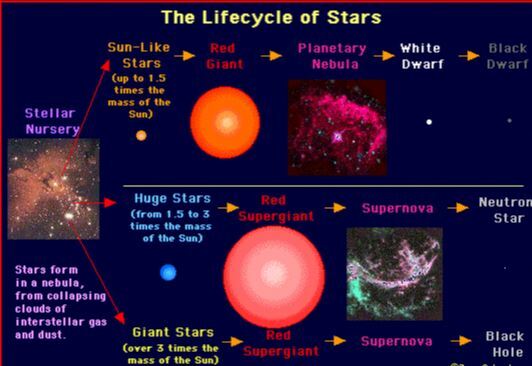 This is the story of how our Nibiru formed and how our ET ancestors settled there. Our Solar System grew from a gas cloud that circled its own center counterclockwise, cooled, and formed both our sun and a dimmer pair-star, a SUBBROWN DWARF–NEMESIS (probably WISE J104915.57-531906.1B ). Both the sun and Nemesis developed planets that circled them. TIAMAT, the very watery planet that would become Earth orbited the sun between the orbits of Jupiter and Mars. 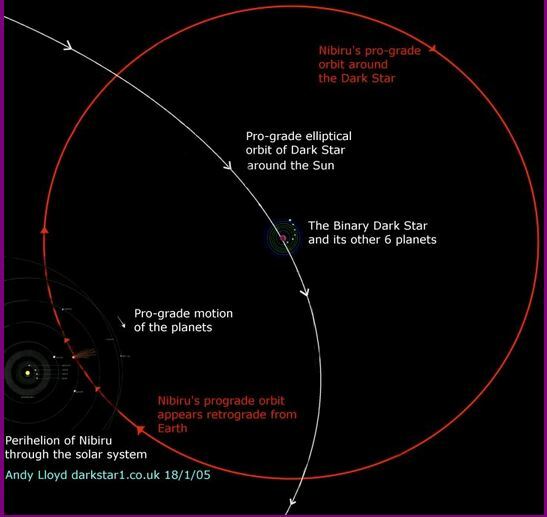 The planet NIBIRU revolves around Nemesis, a dark subdwarf star more massive than Jupiter. Nemesis nears our Sun, at the KUIPER BELT, 48 Astronomical Units from Earth, every 10,800 Earth years. Nibiru circles Nemesis but did not orbit our sun. Instead, every 3,600 years Nibiru passed though our inner solar system between Jupiter and Mars. One of Nibiru’s years (the time Nibiru took to circle Nemesis) was thus 3,600 Earth years–long enough for 180 generations of Homo Sapiens Earthlings to live and die. [Lloyd, Dark Star: 176 -181, 225 – 228]. Since then, Nibiru’s revolution’s speeded to 3, 450 Earth years. “For tens of millions of years Nibiru returned to the inner solar system, bringing repeated catastrophic effects to the inner planets. 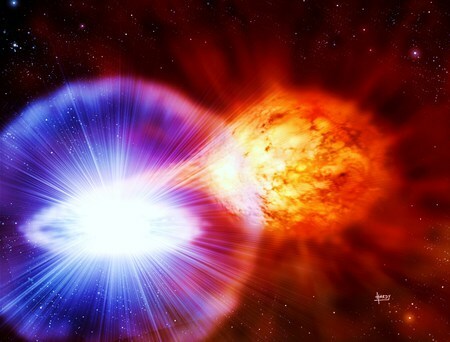 Earth was pummeled by thousands of asteroids. Then Nemisis, the Dark Star, underwent massive orbital expansion, eventually locating safely beyond the Oot cloud. “Within our immediate galactic neighbourhood,” Lamiroy writes, ” there are several humanoid races. Most of them are physical; some are not. Most visited the Earth; some of them still do, and have bases on Earth. We are descendants of human-like races who visited Earth.” They were from star systems of Lyra, Vega, Sirius, Orion, the Pleiades, and Andromeda.” The humanoid races came from Lyra millions of year ago and most now operating in our gallaxy descended from the Lyran/Vegan group, usually crossbreeds of local and Lyran/Vegan genomes. These ancient civilizations “ventured into space and started colonising, encountered other races and civilisations. Conflicts erupted with other civilisations and this led to mass migrations and to endless wars.” Some of these wars took place on Earth. 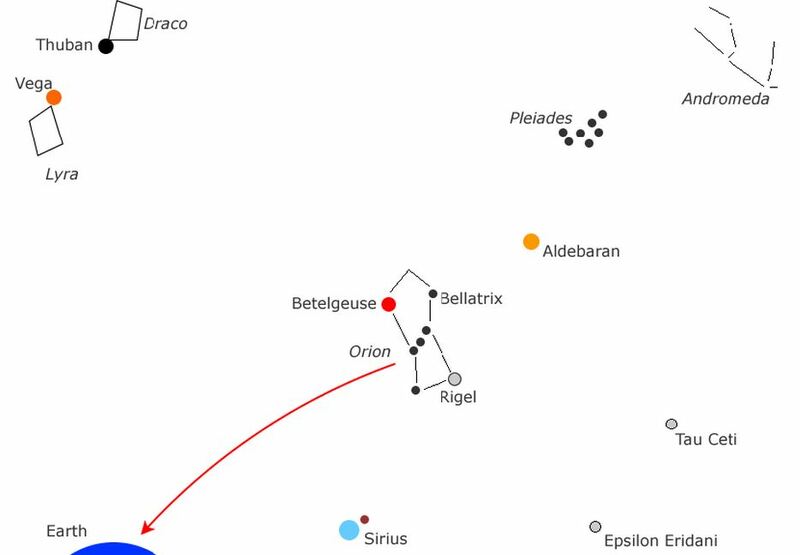 The combined Lyran-vegan explorers also later met Reptilians in the Draco constellation. The Draco Reptilians had colonized a huge empire from Thuban in Alpha Draconius billions of years before the Lyran/Vegans arrived in Draco. The Reptilians colonized a huge empire with humanoid worlds they conquered or who joined voluntarily. 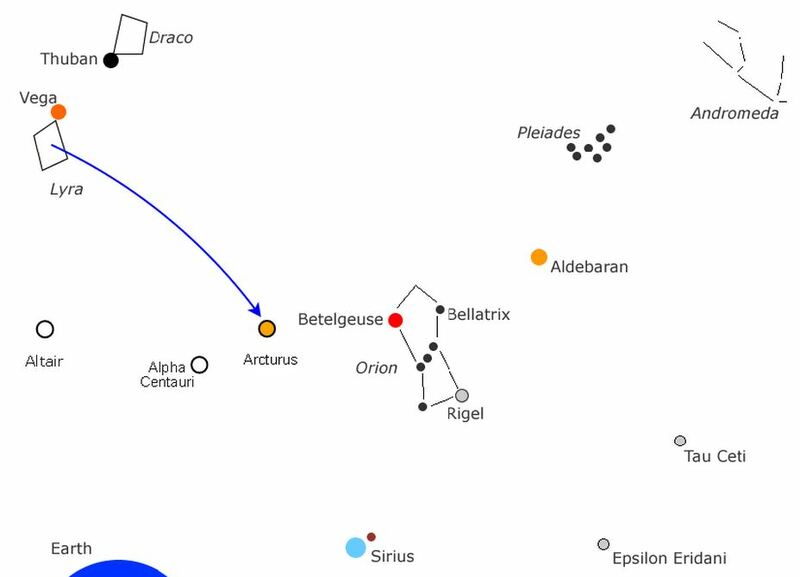 The Dracos colonized not only the Alpha Draconis, but also the Epsilon Bootes, Zeta II Reticuli, Polaris, Rigel (Orion), Bellatrix (Orion), Capella (Alpha Aurigae) systems. The Lyran-Vegan explorers fought the Dracos in the Ring Nebula over planets each sought for themselves. Dracos attacked the Lyran home planets and killed Lyrans by the millions. But by then most Lyrans had already gone to other worlds. 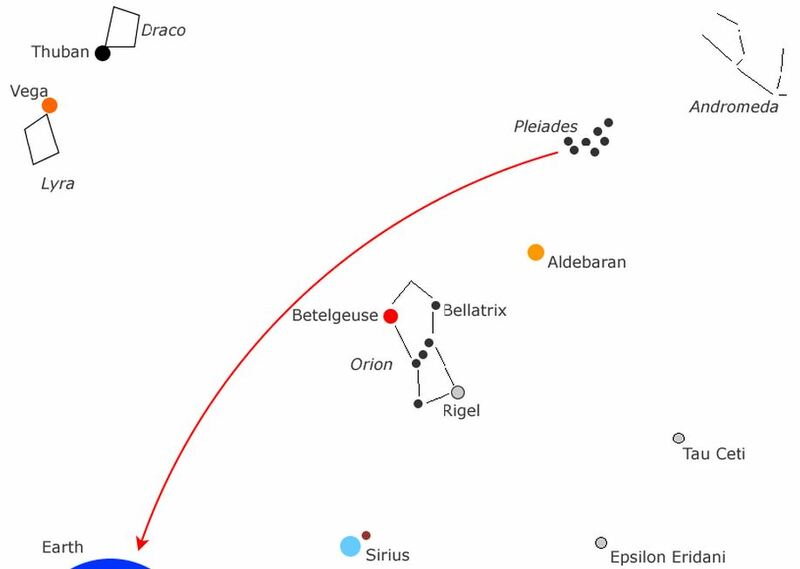 Lyrans in the Orion colonies hit Reptilian colonies in Orion and the Dracos struck back. 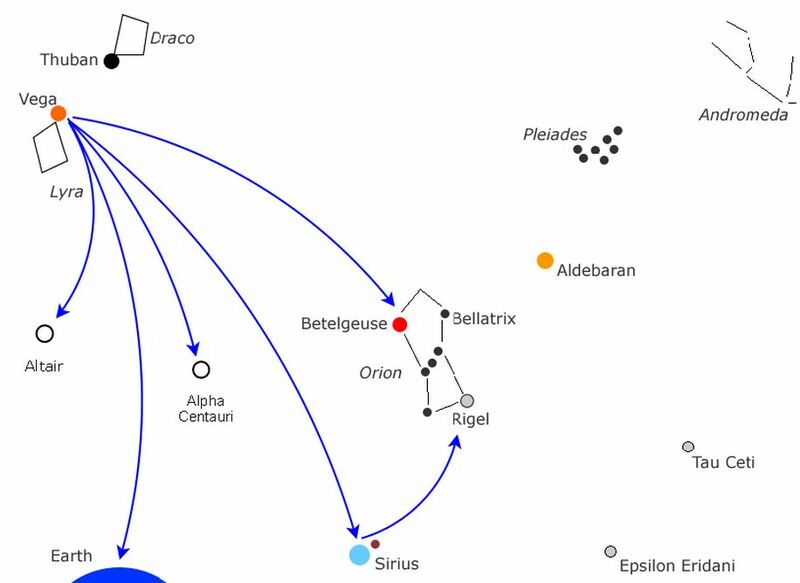 When the wars between the Lyrans and Dracos started, there was no Orion Empire yet but there where co-operation agreements between the Vegan settlers and local Reptilians on Orion-neighborhood planets. These worlds rebelled against their Draco rulers and joined Lyrans against the Dracos. All these forces became the present Federation of Planets from Lyra, Andromeda, Pleiades, Hyades, Iumma [Wolf 424], Procyon, Tau Ceti, Alpha Centauri, and Epsilon Eridani, all of Lyran-Pleiadian heritage. The Federation, Lamiroy says, includes “non-physical races, Sirian groups, Orion organisations as well as Koldasians and Dal civilisations from a parallel universe. Some Reptilian worlds joined the Federation to escape Draco rule. Cooperating Vegans and Reptilians of Orion began the Orion Empire around the time the Federation started. In all likelihood. “They did this to stay out of the wars.” But the wars went on. “22 million years ago, the first humanoid civilisations colonised Vega, which was already inhabited by humanoids and Apex. 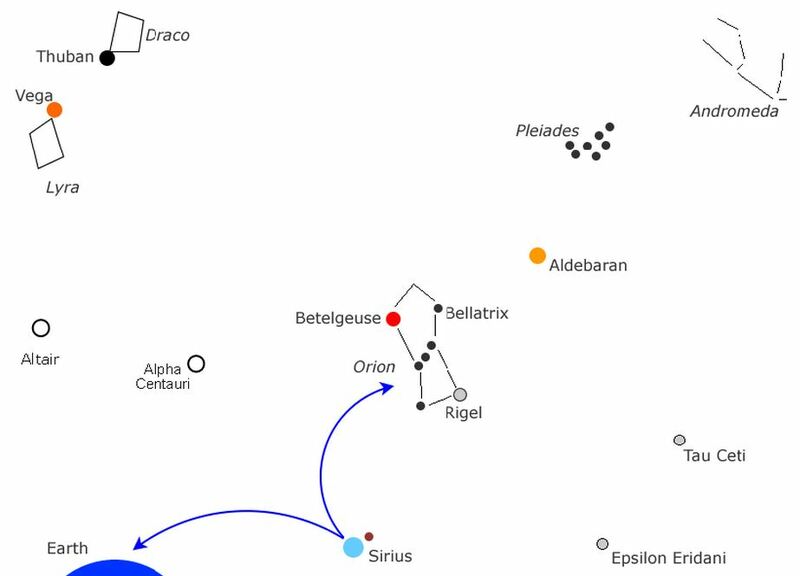 Lyran explorers moved on to Sirius, and Orion; others came to Earth and from Earth moved on to the Pleiades. Draco-Federation wars lasted millions of years. 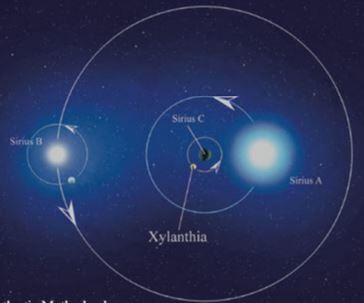 Humans and Reptilians fled the wars to Sirius’ planets. Several moved to Earth. Wherever these refugees went, wars followed. Some groups in Sirius tried marriage between royal lineages to create a dynasty to unite everyone but many people refused loyalty to the new dynasty. Groups with different agendas now inhabit the Sirian system. Members of this new dynasty settled on Nibiru (which would shoot out of its original orbit around Sirius C to a path that crosses our inner solar system then clockwise off to an ellongated orbit to Nemesis, the somewhat cooled remains of Sirius C. Royals of the combined would-be Unity Kingdom settled the planet Nibiru. 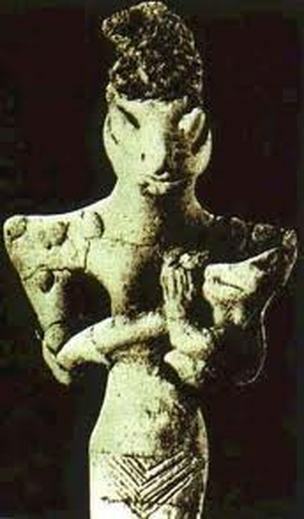 These Sirians became our ancestors, the Nibirans. The Nibirans–Anunnaki to us–adapted their genomes to Earth to create us. The Federation got fed up with the war after some of its members broke away because the Federation resorted to warfare. Neither Federation nor Dracos launched a large-scale attack to avoid driving rebels into the other’s camp. The Unifier from a higher dimension taught both Federation and Draco to stop polarizing reality. He conveyed to the warring parties that only unconditional love and forgiveness would end war. Transcend and value value your differences he told both Federation and Draco and they pledged peace and members of both alliances experienced a dramatic increase in awareness and rise in con­scious­ness. “Entire masses of people ascended into a higher dimensional reality. But peace was not established everywhere, as not everybody was ready to accept these new teachings. There is today fighting on Earth, unfortunately,due to our majority of dualistic thinkers. Yet” Lamiroy reminds us, “overall in our galactic neigh­bourhood there is peace, and where there is no peace, there often is a truce. Many of the players of the galactic wars are still around today. The Federation is still active, as are the two Empires. Since the war ended, they live more or less in peace with each other, even though there still are groups that keep on fighting. In more recent times, we see a resurgence of aggressive colonisations, by some Grey and Reptilian groups. This led to a an exit of the Alliance of Arcturus, Korender, Procyon, Alcyone from the Federation. The Federation usually avoide interfering in Earth affairs. The Alliance is more willing to help us become more peaceful, less polluting, more spiritual and unified. Procyon started as a colony by Rigelians of Lyran descent. When Greys took Rigel, Rigelian Blonds fled to Procyon. Procyons fought and chased Greys off Procyon.